Yes He could and yes there was. A preposterous comment to make? It is not when you consider the story how God resolved this quandary because it IS the reason for that first ‘Easter’. Just hold on because this gets interesting. Where or what could the God of Glory possibly be lacking or not perfected? In one thing – Strength or Power. And God in heaven with all power and strength could not contain it. Why? First of all the power to defeat sin and death demanded perfected strength that only perfected weakness could produce. Weakness does not reside in the heavenly dimension. Heaven occupies eternity along with its storehouses of God’s glory, grandeur, and splendor. This source of weakness must be found elsewhere. According to God’s commandment only blood can remit and eradicate the root of sin. Since blood and weakness are not “naturally occurring substances” in the heavenly realm, they would have to come from another source. The Lord had the sin solution all figured out “before the foundation of the world”. God zinged a split-fingered, 101 mile-an-hour fastball right past a swinging, spinning devil who thought his pretty little game (pre-fixed mind you by his bookie agent named ‘Death’) was airtight. Wrong. Jesus Christ in the process of becoming infinitely weak through the crucifixion as the Son of God became infinitely strong or powerful. There has never been nor will there ever be an act of earthly weakness so profound. God in flesh, the Creator of all living, placed Himself into the hands of His Creation. It was the crime of all ages. The ‘Creator’ mercilessly killed by the hands of the ‘Created’. The thought is mind-boggling, sobering and paradoxical. 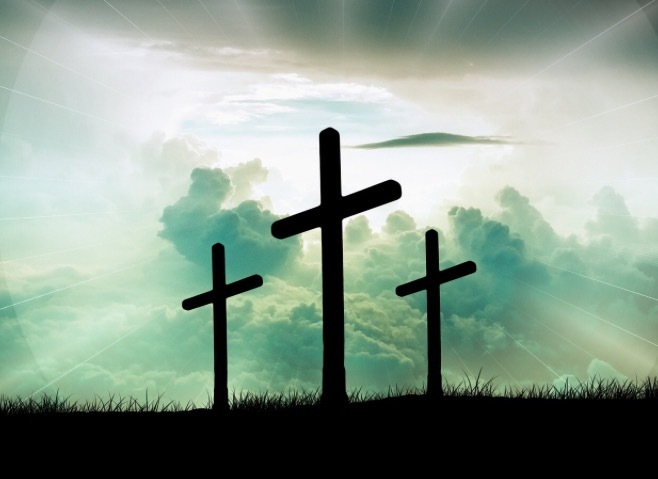 One writer penned it this way: “God’s involvement with shame has spun a web of mystery too intriguing for the human mind to let alone.” The crucifixion was so earth-shattering that the planet would no longer revolve around an axis between the North and South poles. After Calvary the earth would now spin on the vertical axis of Jesus’ cross spanning the heaven and the earth. Someone recently made a commitment (regarding the Christian walk) as to “Why crucify the flesh? What advantage can possibly result in living a cross-bearing, crucified life before God?”. This is why. It is said ministry is “flow”, the flow of God’s spirit through broken vessels of clay. Something miraculous will result when that flow operates unhindered from fleshly motivations and carnal thinking. Yes, we are not perfect, but that does not preclude the miraculous from happening “through us”. And when it does, nothing and no one can take credit for it, for it belongs to God and God “gets the Glory” for it. God needed perfected strength to conquer this last enemy death. To accomplish this God had to become perfectly weak so that He might become perfectly strong. When we ever get a grip and clear understanding of Calvary’s Love, we will be forever eternally changed. When you think about it, there are only two principal driving forces in life: love and hate. They both result in action (read the news about the latter). Jesus came to this world to set the record straight regarding the most powerful and constructive life force on earth: love. Love is the reason for Easter. It is said the great preacher Jonathan Edwards on July 8, 1741 in Enfield, Connecticut preached a famous message entitled “Sinners In The Hands of an Angry God”. It is recorded the message was so energized and powerful one could almost feel the heat of hell and smell the acrid scent of burning flesh. Unfortunately, when it comes to God and faith, fear will only take you so far. And if by perchance it happens to take you all the way on your journey home to heaven, it will be a most joyless, sad and burdensome one to say the least. If Mr. Edwards were alive today the Lord just may alter his title and its content. The impact of his message and its response if preached with the same zeal and passion may bring the same results in this day and age if focused on another aspect of salvation. There is no question the fear of the Lord is the beginning of wisdom and we are to “work out” our salvation with “fear and trembling”. We definitely need to fear God and reverence Him. But, there is a flip-side to this equation. What is it? It is God’s love. But, who has yet to speak with lips of clay the whole essence and total expression of what Calvary’s love really means? If they ever do, it will eternally change the souls of those who might hear the truth concerning the love of God as the Savior of the world – Christ Jesus. It could be that what the generations of people living on earth today who are inundated with fear, hatred, sexual immorality, heartbreak, brokenness and weariness from the pressures of life need to hear something else. What this world needs and the one thing the church has at its fingertips is an inundation and heart-transforming message of “Good News” – the gospel of Jesus Christ: (I Corinthians 15:1-4). It is high time for a resurrection. God is calling His church and the world to be resurrected from the graveyards of past mistakes, failures and SHAME! God is calling for His Creation to sing again. I am clean, I am clean.